Hood River, Or – Full Sail Brewing is proud to announce the release of a new beer in their Brewer’s Share Series - Chris’s Summer Delight, developed by Brewer Chris Haveman. In 2008 Full Sail Brewing created their small batch Brewer’s Share series as an opportunity for each of their individual brewers to express their creations to be shared on tap exclusively in their pub. Since their crew came up with so many great beers, they decided to share a selection of them with beer lovers everywhere. The beer will be released in 22oz. bottles and on draft in June. When asked what the inspiration was for his beer Chris said simply “I love summer. When I found out that my beer was going to be brewed at the beginning of summer, I immediately thought of the perfect style, a Berliner Weiss. This is an easy drinking, unfiltered beer made with 50% wheat malt, a tiny amount of hersbruker hops and a touch of lactic acid to give it a refreshing tartness.” After careful and numerous tastings Chris’s beer was pronounced delicious. The beer is dry and crisp with a slight tartness and flashes of lemon. On a hot summer day this is the ultimate outdoor beer. It is traditionally enjoyed in Berlin beer gardens with splash of sweet red berry syrup or a green herbal syrup that work well against the tart and acid flavors of the beer. 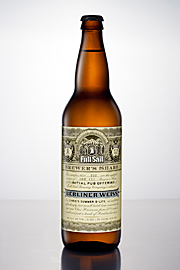 Try Chris’s beer at Full Sail’s Tasting Room & Pub with some of the syrups made from local fruits by our kitchen staff. ABV 4%. IBU 9. With each Brewer’s Share series beer, Full Sail picks a local charity or organization to receive a portion of the proceeds from the sale of the beer. 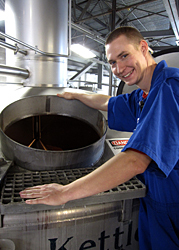 Chris has chosen to support the Oregon State University Brewing Sciences Program, from which Chris is an alumnus. The program is one of the few in the nation that studies all aspects of producing beer, wine, and fermented foods. Full Sail’s Brewer’s Share small batch offerings will be available in 22oz. bottles and on draft. The other beers in the 2012 line-up include Extra Special Barney (ESB), Phil’s Existential Alt and Big Daddy J’s Malt Liquor. Full Sail will release one Brewer’s Share at a time and a new beer will be released for each season.